The Courtyard Dairy – why you should choose to buy cheese and cheese gifts online from The Courtyard Dairy. “Few people who sell cheese deserve the title of ‘cheese refiner’ but the young Andy Swinscoe certainly does.” Joan Ransley, food writer. The Courtyard Dairy’s young enthusiastic owners, Andy and Kathy Swinscoe, have selected only the absolute best cheeses from small farms. The cheeses are then given a magical touch of special maturing, learnt first-hand from working for the most famous cheese-mongers of France and England. Each cheese has been selected to be one that ‘wows’. Each cheese is carefully selected direct from the inpidual farm, and only if the cheese is superior in quality and taste. The Courtyard Dairy makes no compromises on providing a carefully-chosen range of perfect, unusual and exquisite cheeses. For the best depth of flavour, the cheeses are still made by hand on the farm, with most farmers using their own high-quality unpasteurised milk from a single herd of animals. Many of these farmers have less than 70 cows (the smallest, just twelve!). They are among the finest cheeses to be found anywhere in the world. Proper farmhouse British cheese! The Courtyard Dairy is a small, independent cheesemonger. The owners, Andy and Kathy Swinscoe, know the stories behind the cheeses they sell, making regular visits to the cheese-makers, talking cheese with them, and helping with the production (find out more about the cheeses here). Each cheese you order will have this background information delivered with it. The Courtyard Dairy was awarded ‘Best New Cheese Retailer’ at the 2013 British Cheese Awards, which was later followed by The World Cheese Awards in 2013 where The Courtyard Dairy won: ‘Best Cheese Counter’ and Andy (owner of The Courtyard Dairy) won ‘Cheesemonger of the Year’. 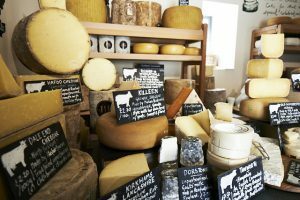 Once the cheeses have been selected from the farm, that’s not the end of the story: the whole of The Courtyard Dairy shop is specially equipped to mature cheese to its best, and to heighten its flavour. The cheeses are carefully maintained whilst they mature to perfect condition – they are not simply locked away in a cold store. It’s also not just simply a case of letting cheese ripen – each cheese has it own special requirements. The cheeses are selectively matured, dried, washed, brushed and ‘flipped’ to ensure they are at their best – so the cheese you buy from The Courtyard Dairy will always be a cut-above (pardon the pun!) 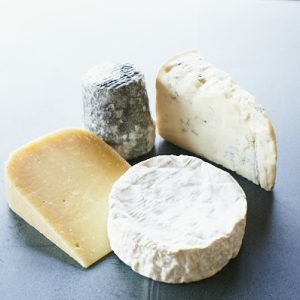 For example, The Courtyard Dairy’s Old Winchester and Killeen cheeses are extra-aged, the Langres is washed repeatedly in Marc de Bourgogne, and the Tunworth is specially selected for more intense vegetal flavours. Find out how The Courtyard Dairy improves cheese. The Courtyard Dairy sells cheese every day in the specialist shop near Settle, and each cheese will be cut fresh from the wheel the day before it is delivered direct to your door. No cutting corners, no compromise on quality or excellence. 4. Amazing flavour – you’ll be surprised how good cheese can taste. Other suppliers, supermarkets and wholesalers don’t always have the relationships with the cheese makers that The Courtyard Dairy’s owners, Andy and Kathy Swinscoe, have fostered. Andy and Kathy know their suppliers, regularly talk to them about the taste of the cheese, and mature their cheese on site at The Courtyard Dairy until it’s perfect. You might occasionally find the same cheese available elsewhere, but it won’t taste the same – cheeses matured by The Courtyard Dairy taste simply amazing! The superb depth of flavour unique to the cheeses available from The Courtyard Dairy comes through careful control at all stages: selecting specific batches of cheese for deep, long, complex flavours; specially selecting cheese that fits an ideal profile; maturing/ageing each cheese on site until it’s perfect; and only selling a cheese when it’s perfectly ripe and tastes truly amazing. Tunworth: The Courtyard Dairy stocks only the extra-wrinkly Tunworths that have had more yeast growth (which produces the wrinkles), giving a deeper, more intense flavour. Kirkham’s Lancashire: only two shops stock made-to-order large (20kg) Lancashires. The Courtyard Dairy is one. (Most shops only have the smaller ‘midi’ size, which is easier to handle, sold younger, and is faster to age.) The 20kg Lancashires age slower than the ‘midis’ and have a richer flavour and a lighter texture. If you don’t believe it, ask Graham Kirkham which he prefers! Hafod Cheddar: cheese maker Sam Holden picks out for Andy and Kathy at The Courtyard Dairy the extra-special batches of Hafod, because he knows they love to showcase his cheese; the inpidual cheeses that have the flavour they love – a rich warmth with a gentle tang. Killeen: this is aged for an additional five months on site at The Courtyard Dairy, to allow it to firm up and allow the sweet, rich, toasty caramelised flavours to come through. Everywhere else you’ll find it sold at 3-4 months old – which doesn’t have the flavour The Courtyard Dairy know their customers adore. Langres: the Langres available from the Courtyard Dairy are washed in Marc de Bourgogne many more times than other versions, giving a more alcoholic, richer, grapey flavour. Dale End Cheddar: the truckles are matured on site in a specific environment, on traditional spruce wood boards, and regularly brushed. Their maturity is regularly tested using a cheese ‘iron’, and when deemed at its peak, the Cheddar is released for sale (usually around 18-months old). And if you don’t believe any of this, you can test it for yourself – simply purchase a cheese with the same name from a competitor. Compare it with one from The Courtyard Dairy. Convinced? Click here to read what others have said about The Courtyard Dairy’s cheese.